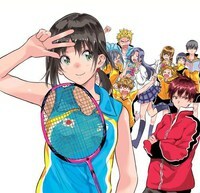 Plot Summary: Kentarō Tachibana is the coach of Kitakomachi High School's badminton team. He is worried because the team has so few members that it cannot even enter competitions, but then he spots a student named Ayano Hanesaki easily climbing a large tree on the school grounds, expertly demonstrating excellent motor skills. Tachibana tries to get Ayano to join the badminton team, but finds out that Ayano hates badminton.